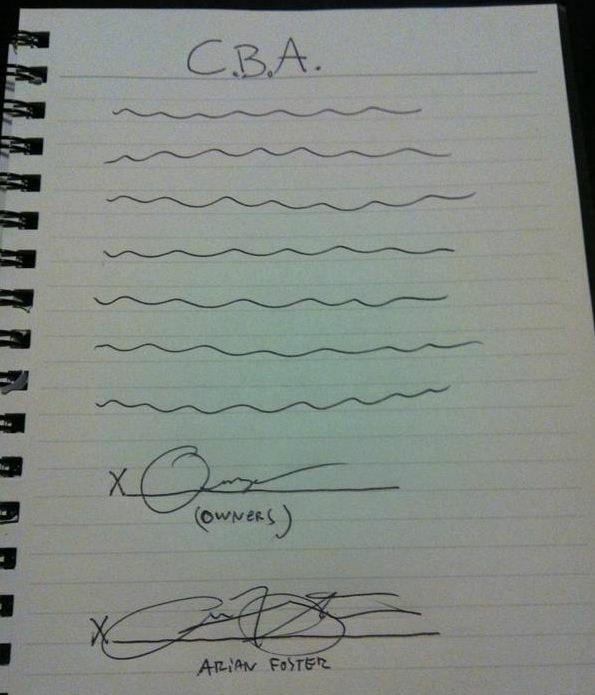 Welp, as you can see… Arian Foster signed the CBA, so I don’t see what the holdup is on this 2011 NFL season. Here’s the tweet he sent with the above picture. Love it. Good work, son. Also, I’d like to personally thank you, Arian, for single-handedly winning me the 2010 Fantasy Football season amongst my peers. You’re the best. This entry was posted in Football, NFL and tagged arian foster, cba, cba letter, NFL, NFL CBA, nfl labor, texans. Bookmark the permalink.